No not the type in the American sense of Christmas but the type where one goes in an actual holiday. I am off to a sunny place this week to freshen up that all important tan and to top up the rather low Vitamin D deposit. And because I want to go in style I engaged in some fun holiday sewing. 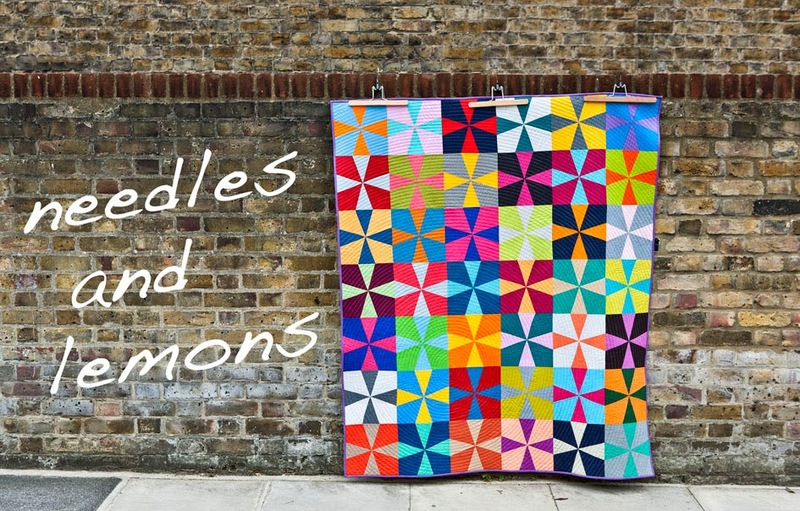 Over the next couple of weeks I will feature a few items I have sewn so you have something to read while I am counting sand grains at the beach (sorry !!). First off my new bag. 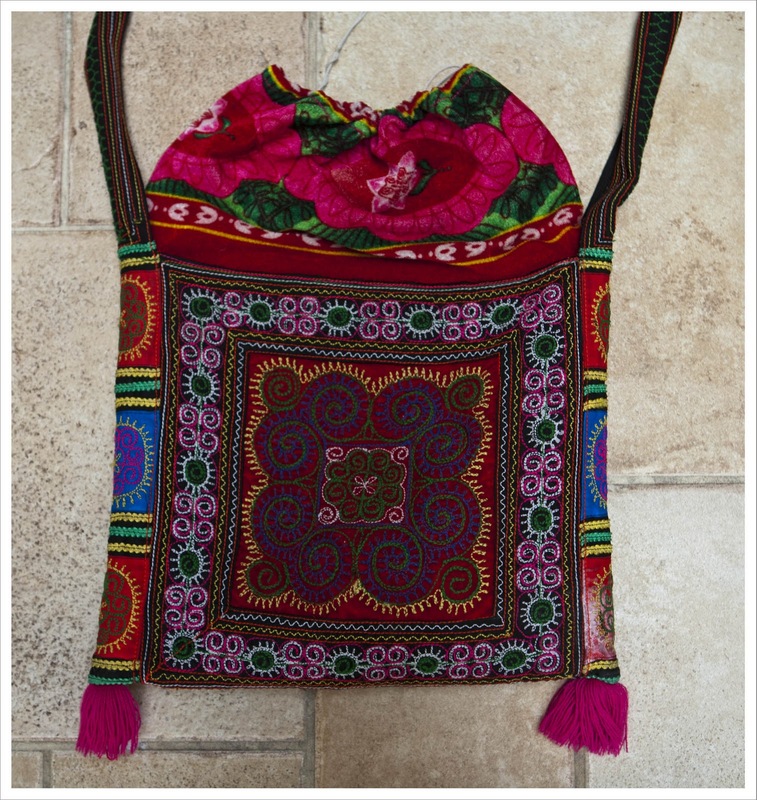 This is a bag I mirrored on this beautiful hand embroidered shoulder bag that I bought some years ago in Vietnam. This is the perfect holiday bag because it weighs next to nothing (unlike a leather bag) and has enough space for the important bits (wallet, sunglasses, book, suntan lotion). As you can see it has this clever drawstring unit at the top that helps to keep longfingers out of the bags. The arrival of 'Ruby Star Shining' inspired bag sewing action my house so I copied my Vietnam bag for which I used one of the panels of the new Melody Miller fabric collections. I think the fabric panels lend themselves ideally to bag making and I used them on most of my previous bags. 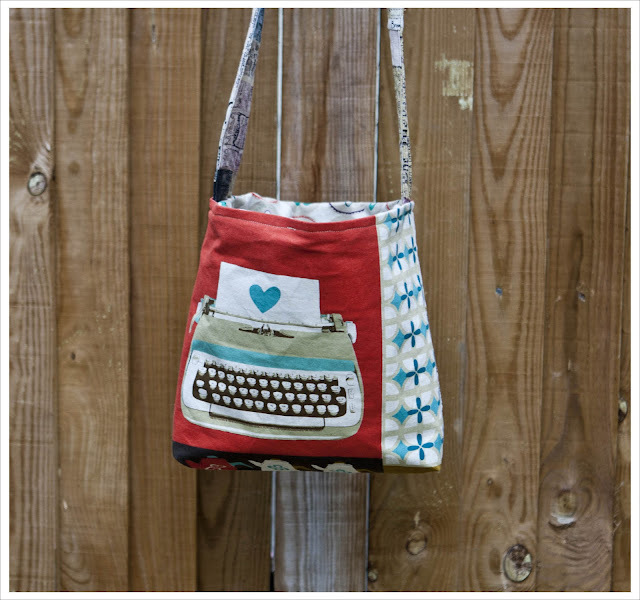 The bag is approximately 13 x 12 inches and has a long strap so the bag sits on the hips. On the Vietnam bag the drawstring unit was simply attached to the top but I wanted a fully lined bag this time and I also wanted the right sight of the lining to show inside the bag AND outside on the drawstring unit. The only way to achieve this is by producing two lining units whereby the top (drawstring) unit has to have a French seam as the seam will be visible on the inside of the unit. French seams are nothing else but a double seam resulting in a clean seam that doesn't fray. You first sew a very narrow seam where the two fabric pieces face wrong sides together and then fold the pieces right sights together and stitch a normal quarter inch seam over the first seam. 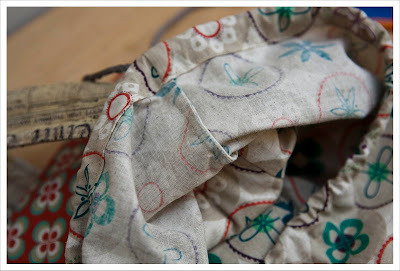 There are plenty of tutorials around, a good one is on Sew Mama Sew. You can see my french seam here in this image. And here you see how the two lining pieces look when sewn together and attached to the bag. 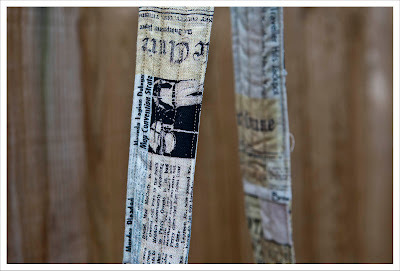 For the straps I used a newspaper print I had in my stash. This images shows the drawstrings pulled together. Have a great holiday!! 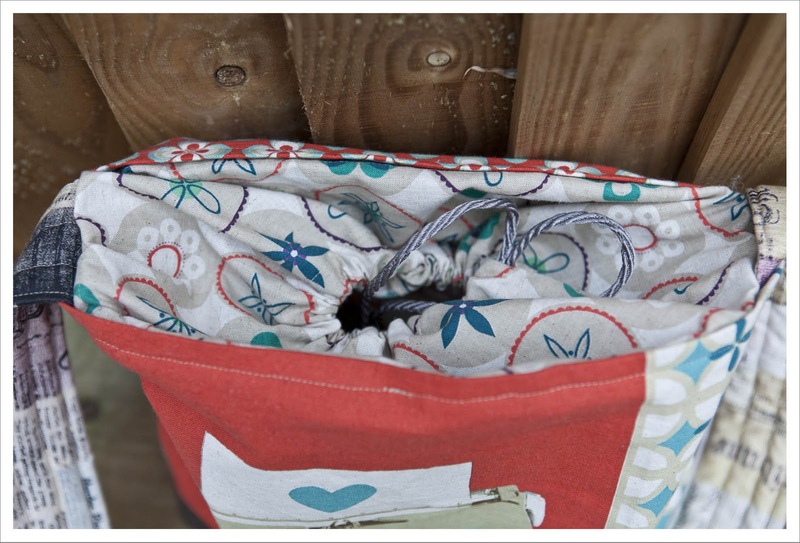 Your bag is a perfect holiday bag too! What a cute little bag! I love everything about it. Have fun on your holiday! Lovely! Fantastic use of that Melody MIller fabric. I have been looking at the wondering what I could do with it.....Love the drawstring unit too, and your whole interpretation of it. 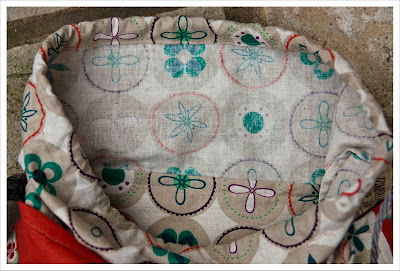 I have a lovely fabric panel waiting to be made into a bag....this could be just the style for it! It looks gorgeous - have a good hol! 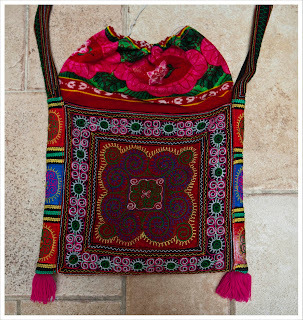 Very pretty bag! Have a lovely holiday! 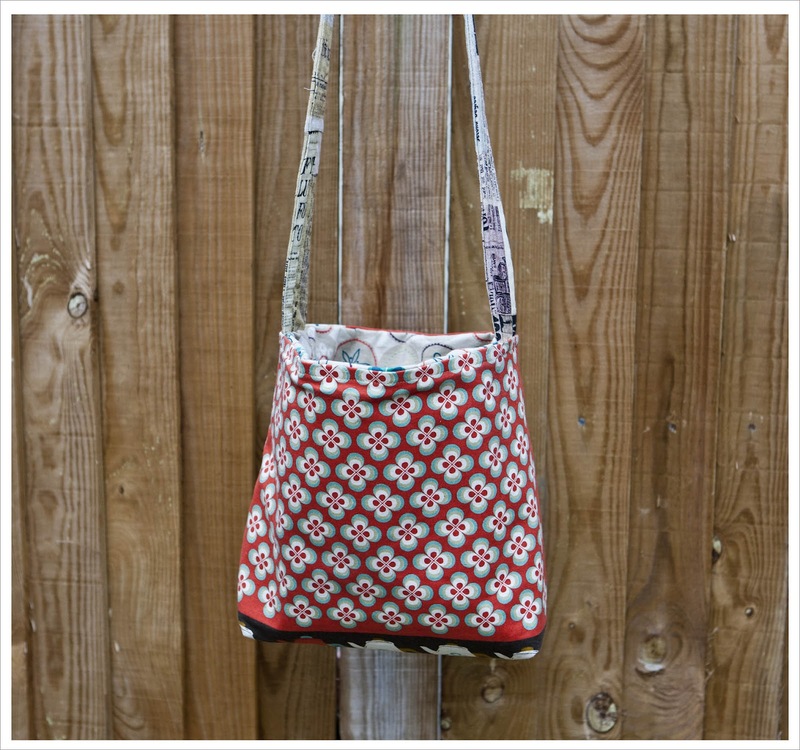 Wonderful bag, I love the drawstring top! Have a great holiday! Oh fantastic - I love the Melody Miller version so much! Oh and have a great holiday, not jealous, much!